On this day in history, July 12, 1776, Admiral Howe's fleet arrives at Staten Island. This fleet, along with other ships arriving before and after, carried the largest British expeditionary force to ever be assembled. Along with other British ships in the waters of North America, it was also the largest amphibious assault force in European history. After abandoning Boston in March, 1776, the British high command set its sights on New York. Orders were sent to several fleets to converge at New York in the summer. On June 29th, the first ships arrived off Sandy Hook, New Jersey. Within 2 days, 48 ships arrived, carrying over 10,000 British troops, along with General William Howe, the general in charge of the war. New Yorkers were astonished. A larger fleet of ships had never before been seen in North America. 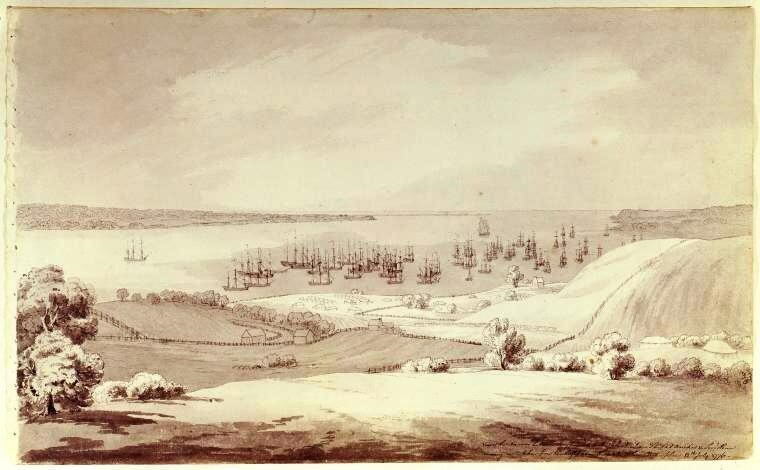 Some reported that the ships' masts looked like a "forest of pines" spread across the bay. New York City to the British. This particular battle was lost by the Americans. Their retreat surrendered New York City to the British. 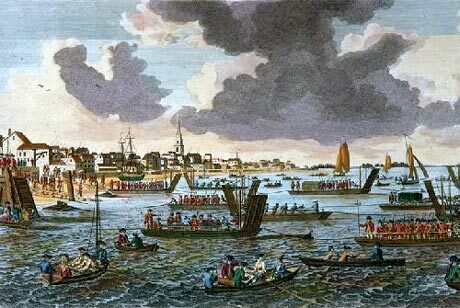 General Howe hoped to land his troops at Gravesend on the west end of Long Island, but, finding the Continental Army firmly ensconced there, his troops began disembarking on Staten Island. This, however, was only the beginning of the British invasion. On July 12, Admiral, Lord Richard Howe, General Howe's brother, arrived at Staten Island with an even more massive fleet. 82 more ships arrived, carrying multiplied thousands of troops and sailors. Admiral Howe immediately started unloading his troops on Staten Island where he met with his brother to plan efforts to offer the colonists amnesty if they would renounce their rebellion. HMS Eagle, arriving in the distance.